Drama Review: W – Two Worlds (South Korea, 2016) – Hello Asia! When the posters and trailers hit for W, the hype was real, and one would understand why. Cleverly directed with a stellar cast and a pretty solid OST, it was no wonder the series broke the double digits in ratings. The brief outline of W – Two Worlds is as follows: When Oh Yeon-joo (Han Hyo-Joo) finds her manhwa author of a father missing, she chances upon his tablet with the scene depicting the death of her favourite character Kang Cheol, played by fellow (pretty) actor Lee Jong-suk. There, she gets pulled into the manhwa world of “W”, landing in front of her oppa’s dying body- but lucky for him, she happens to be a surgeon. 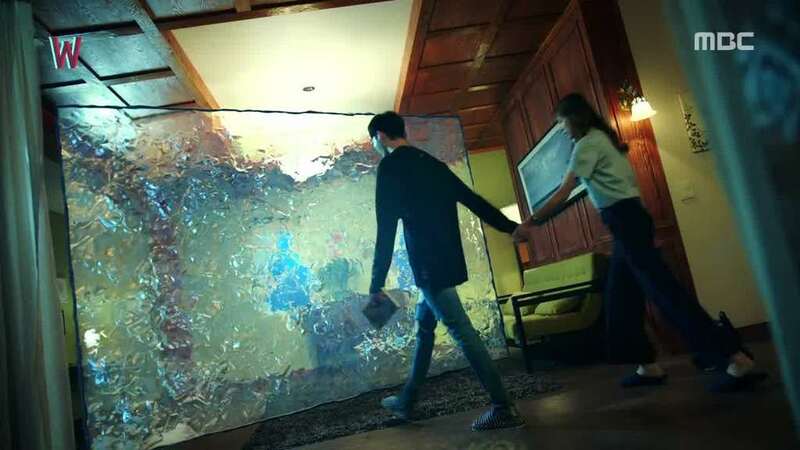 Thus, it begins their inter-dimensional romance, as they navigate through the rules of their worlds to see each other. However, things are not as simple as they seem, and with the blurring of the two worlds, the question really is: Is there such a thing as a “Happy Ending”? W – Two Worlds is a series packed with a multitude of themes- thriller, action, mystery and romance. I can speak for a majority of fans when I say that meeting your idol/oppa/bias in real life would essentially be a dream come true for us, as it was for Yeon-joo, when she finally meets Kang Cheol without the life-threatening situation at hand. We follow her journey, as a devout fangirl trying to prevent his death- at the hands of her father no less! What this show does is very clever in the sense that it brings up so many questions, especially related to the writing of a plot – the essence of any story. As with most Korean dramas, we as an audience knows the frustration of a poorly written plot. 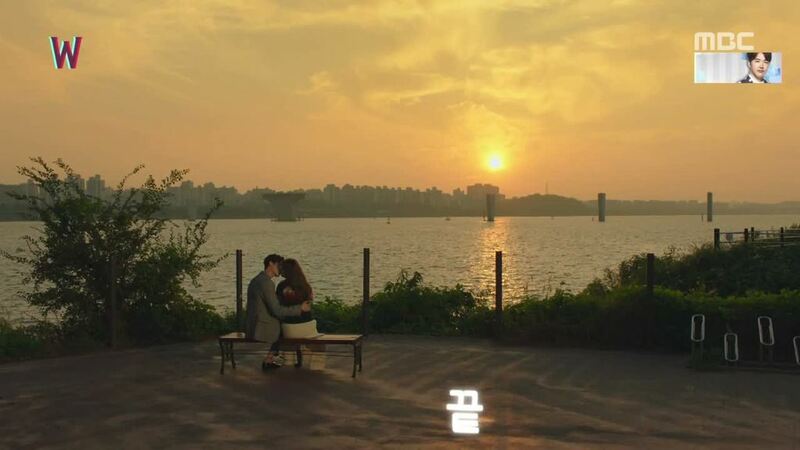 From noble idiocy to amnesia and convenient resolving of obstacles, it is safe to say that this drama has little of this as in issue – in fact; one of the side plotlines involves a faceless villain. 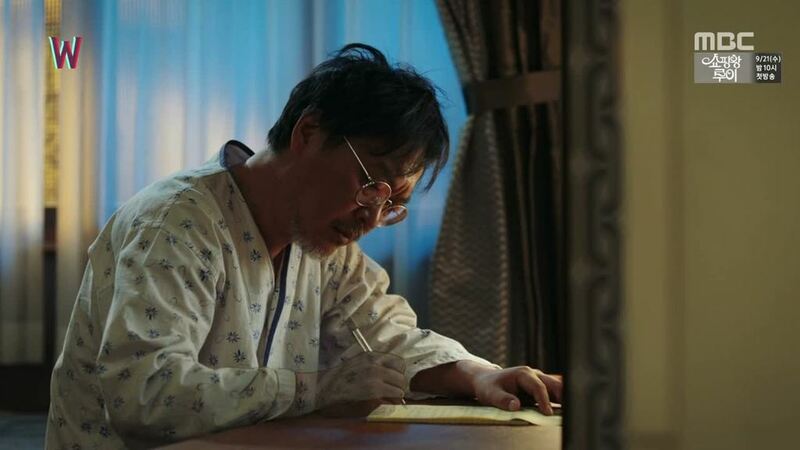 In “W”, we learn that Kang Cheol’s family was wiped out by a killer, which is a common device used in many backstories of the main characters (I don’t see how it is supposed to build character either but hey). There’s definitely a level of meta at play, especially when we never see the killer’s face, never learn his name, his sole purpose to kill the ones who are precious to Kang Cheol, the main character – and even more terrifying is the merging of both dad and the killer, where he finally decides to give the killer a proper form. I do warn that it’s not quite for the faint hearted! Another trope I was happy to see used properly instead of a convenient plot device was the erasing of our hero’s memories via a deliberate action of his creator. Instead of it being the usual amnesia and pausing of the romance line, the memory erasure was more of a reset. There was no regaining of the memories, but rather the hero seeking to connect to our heroine again, and for that, I commend the slick writing that didn’t fall into the trap of an easy solution. Emotionally, the show delivers. Whether it is scenes between our main couple, the killer and Cheol, or even the author (Yeon-joo’s father) and creation Cheol. It draws you into the feel of the moment, both due to the actors as well as the directing and music. There is not a wasted opportunity to capture important parts of all the characters’ interactions, causing the audience to be invested in not just the characters with the most screen time, but the side characters that are entangled with our main couple. While I personally enjoyed many aspects of the series, what I found fascinating was how well the travelling between the two worlds was done. In the beginning, we could definitely see the sheer difference in both worlds, as if it were representing Kang Cheol and Yeon-joo. The “rules” of the manhwa world were extraordinary to explore, and was a key point in the flow of the plot. When Yeon-joo is trying to work out how to leave “W” and help Cheol survive from the outer world, where he is simply considered a character. Even the creator-creation relationships is thought about in detail, especially at the pivotal moment for our main couple, when Cheol requests for her to write herself out of his life, to finally give into his fate set by the author in order to restore some balance for the both of them. It is this scene that drives home the imbalance in their romance, as well as reminding us as the audience that while all Yeon-joo wants is a happy ending, the genre of the manhwa constantly pulls it back to the main genre – W is a thriller, not a rom-com. Touching more on the creator-creation relationship, it has to be said that there are moments that are very dark, and very befitting the plot development of W. Some scenes can be a little disturbing, especially when with the whole villain sharing souls, the magical tablet of creation and Assembly man Han’s ‘interrogations’. By allowing the characters in a manhwa to have that self-awareness that the world they live in is a construct, it breaks down that fourth wall, depicted in the way Cheol looks directly into the camera, as if to us viewers from within the show. 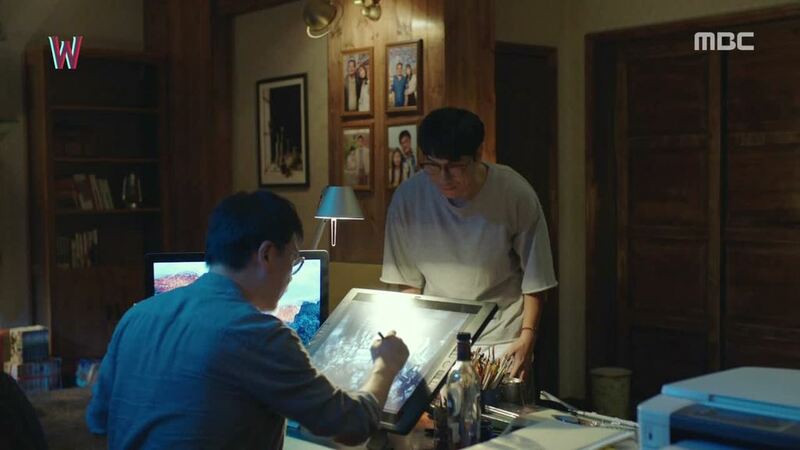 In addition, the use of the tablet connecting and controlling the manhwa world was expanded, exploited and constantly a key player within the series, having the power to control anyone or anything as long as it is within the manhwa episodes. And even then, when the characters start to question their own existence, what would happen to the balance between real life and fantasy? There’s never a dull moment in W – Two Worlds either. Pace wise, it constantly brings us from one twist to the other, from quiet romantic cuddles in bed to full on crazy moments with the bad guys of the show. As the show progresses, the blurring of worlds is far more prominent, with less “to be continued” and more instability, as depicted when Yeon-joo’s father hails a cab in the real world, only to be transported into “W” again, without any warning, and unprepared for anything to come. If there was anything to critique in this otherwise brilliant series, it is how the direction went towards the end. Up to episode 13, everything was poised for the final episodes to finish on a high- that is, if it didn’t go off the rails. Unfortunately, because of the blurring of the worlds and perhaps the meta at play, the way it wrapped up was a little bit unsatisfying. 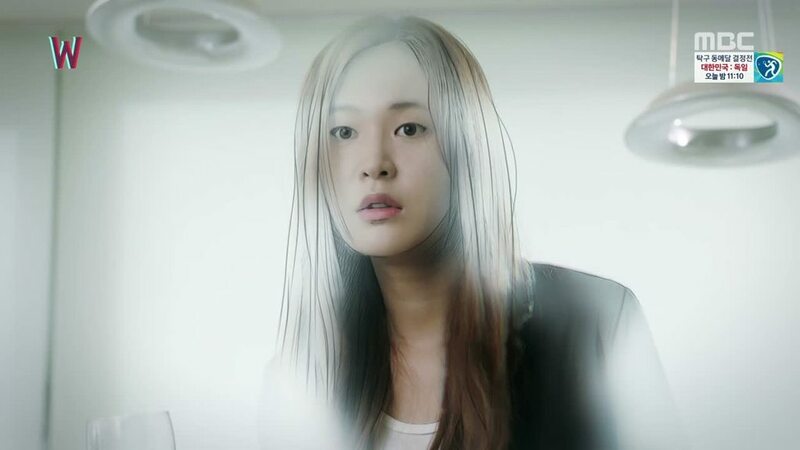 In a “one must live for the other to survive” scenario, Yeon-joo’s father sacrifices himself in the final episode of W, both the manhwa and this series, raising the question posed at the start. Is there such a thing as a “Happy Ending”? 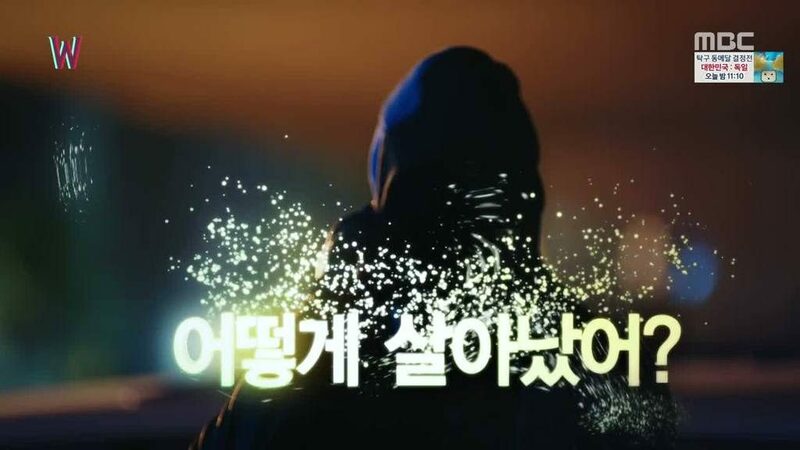 For these characters, it was sort of bittersweet and slightly unresolved; when Cheol still hands over his manhwa business card to Yeon-joo’s mom, though it is clear the “baddies” are dead, so is the creator of the manhwa. Did he destroy the story, or did the story destroy him? The main issue I had with the series overall was that it opened so many questions, but so many went unresolved. All we know is that the couple ended up together, somehow. Overall, I would recommend that you give W – Two Worlds a go. The acting is great, the plot is (mostly) solid and the cinematography is breathtaking. Like a rollercoaster – a brilliant thrill, but ended up a little bit dazed and confused at the end.